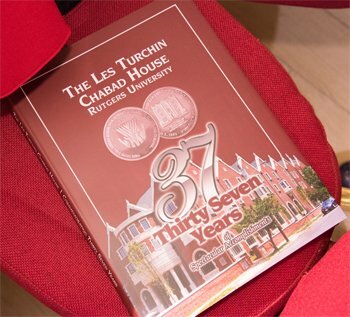 Challah, Candles & a Beautiful Mikvah In honor of the 37th Anniversary of the founding of Chabad House at Rutgers University, Chabad has recently published a 204 page coffee-table pictorial album. This book is complete with the history of Chabad House, from its humble beginning in a rented room to its present day location in the heart of the Rutgers Campus. Colorful stories and photos depict all aspects of the Chabad House and its outreach activities at Rutgers, and throughout New Jersey. Forty pounds. That’s how much flour Rebbetzin Sarah Goodman and the young Rutgers women who bake with her each Thursday night use. Their beautiful braided challot go not only to the Chabad dining room, dorms, and students’ families but also to homes and hospitals throughout New Jersey. Ask anyone who knows her and you’ll discover that she is not only nourishing bodies. Rebbetzin Goodman is nourishing minds, souls, and future generations. Ask her, and the rebbetzin will share that one her most important tasks is raising awareness about the mikvah and myths and truths about the Jewish view of family life and intimacy. Rebbetzin Goodman often provides tours of Chabad’s spa-like mikvah on Thursday nights for the young women who join her for challah baking. Students are usually incredulous to discover the mikvah’s luxurious touches that include ambient lighting, soft music, lush plants, spa robes, and varied other amenities. 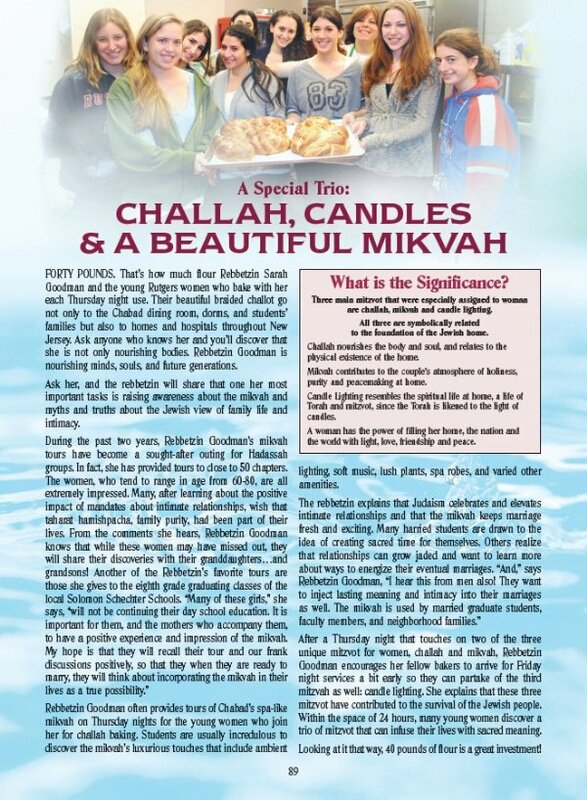 After a Thursday night that touches on two of the three unique mitzvot for women, challah and mikvah, Rebbetzin Goodman encourages her fellow bakers to arrive for Friday night services a bit early so they can partake of the third mitzvah as well: candle lighting. She explains that these three mitzvot have contributed to the survival of the Jewish people. Within the space of 24 hours, many young women discover a trio of mitzvot that can infuse their lives with sacred meaning. Looking at it that way, 40 pounds of flour is a great investment! Three main mitzvot that were especially assigned to woman are challah, mikvah and candle lighting. All three are symbolically related to the foundation of the Jewish home. Challah nourishes the body and soul, and relates to thephysical existence of the home. Mikvah contributes to the couple’s atmosphere of holiness,purity and peacemaking at home. Candle Lighting resembles the spiritual life at home, a life of Torah and mitzvot, since the Torah is likened to the light ofcandles. A woman has the power of filling her home, the nation and the world with light, love, friendship and peace.